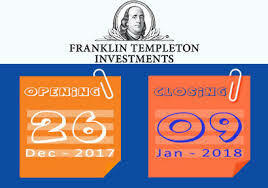 Franklin Templeton Mutual Fund has launched a new fund named as Franklin India Fixed Maturity Plans - Series 5 - Plan F (1203 days), a close-ended debt fund. The tenure of the scheme is 1203 days from the date of allotment of units. The New Fund Offer (NFO) price for the scheme is Rs 10 per unit. The new issue will be open for subscription from 07 February to 12 February 2019. The investment objective of the Scheme is to seek to generate income by investing in a portfolio of fixed income securities/ debt instruments maturing on or before the maturity of the Scheme. The scheme offers growth plan, dividend plan (with payout facility), growth plan-direct and dividend plan-direct (with payout facility). Further, Plan (s) with a maturity of over 365 days also offers quarterly dividend (payout facility only) and quarterly dividend-direct (payout option only). The scheme shall invest 80%-100% of assets in debt instruments with low to medium risk profile and invest upto 20% of assets in money market instruments with low risk profile. Entry Load & exit load are not applicable. Benchmark Index for the scheme will be CRISIL Composite Bond Fund Index. Umesh Sharma and Sachin Padwal-Desai are the fund managers for the scheme.